Equine-Assisted Learning is a powerful, professional and effective approach, proven to have a positive impact on individuals of all ages. How? By including horses in specially-designed experiential learning exercises, equine-assisted specialists are able to observe non-verbal communication of the horses and be a translator as well as a guide to encourage the learner to attain the outcome of each exercise. This hands on approach to learning has proven to greatly multiply the participants retention and understanding of skills learned. We like to call this "THE FORMULA FOR SUCCESS"
While EAL has the ability to take an individual through a powerful journey of learning and understanding. The most asked question is "WHY HORSES"
Horses are sensitive, aware of their surroundings and quick to react. They watch for the slightest movement and look for threatening body posture. Horses know how to discern the difference between a calm, non-threatening approach and anxious, nervous energy. However, every horse is different just as each person is unique. In a horse’s world, the boundaries are clear and easy to understand. Horses look for strong leadership and are willing to follow after they find respect and trust. If we provide contradictory behavior they start to question and challenge our authority to lead. In a horse’s world, team work is expected and respected. Horses respect fair consequences. Horses cannot lie or over think a situation. They approach honestly to every interaction. Learning to listen to what horses have to say is powerful and can sometimes be the catalyst to individual change. Horses react to stimulus and provide a skilled facilitator with an opportunity use the horse as a barometer. By their intuitive nature, horses can provide facilitators with a window into the participant’s personality. Through the discovery of how sensitive horses are, how kind and forgiving they can be, we can guide participants to becoming better individuals through identifying specific horse behaviors. If you can understand how and why horses react to stimulus provided by us – you will come to understand how this program works. "When the whole world says 'Give Up', a horse will whisper 'Try It One More Time"
EAL program was also the recipient of the Samuel McLeod Business Award for Innovative Programming. In 2008 the Cartier team was individually recognized for their equine contributions. Daryl Cartier by Western Horseman’s Person of the Year, and Gayle Cartier with the Excellence In Leadership Award presented by the Saskatchewan Horse Federation and the Farm Animal Council of Saskatchewan. 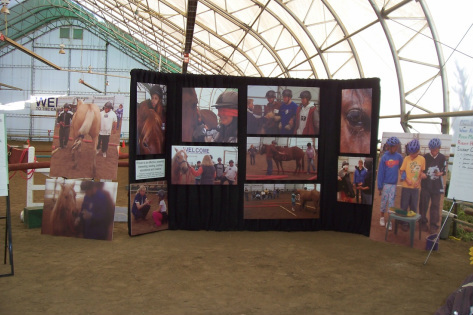 In 2009 the Cartier Equine Center became the focus of a collaborative community-based research project through the University of Saskatoon Faculty of Social Work, University of Regina and University of Calgary to study how horses assist in the healing of First Nation’s youth who abuse solvents. This research was released in June of 2013 and can be found through the Addictions Research Chair website (Colleen Dell, Ph. D) under the document name "The Helping Horse". "﻿﻿At Cartier Farms, we don't think we have even scratched the surface of what horses can do.﻿﻿"